It was a great night for the Banner but a tough night for the Deise. A second successive July qualifier exit for the county senior side resulted in gloom enveloping Clare hurling circles since last Saturday’s reversal in Thurles. But amidst the fallout from a mid-summer departure from big time hurling, Clare received a surge of optimism once more tonight. Clare produced a gutsy display to upset the odds and overturn a richly talented Waterford team. Early on their grasp on this game looked to be slipping but they chalked up 11 points between the 20th and 40th minutes, with that scoring burst proving crucial. The U21′s are the last Clare hurling side still flying the flag in 2015 and they have prolonged their season for another fortnight. The bulk of the 6,639 fans were of a Banner persuasion and the post-match scenes indicated that this victory resonated. Waterford hurling was also in search of a fillip in the wake of a senior defeat last weekend. Given the quality in their team and the impressive nature of their quarter-final win over Cork, it was hoped that the Waterford U21 outfit would provide that boost. They were hot favourites and started well to be in control after a third of the match with a 0-9 to 0-5 lead. Either side of the break, there were worrying signs for Waterford as a resurgent Clare took over. But Patrick Curran’s goal pushed Waterford back ahead and offered the perfect springboard for victory. They could never kick on though and the momentum drifted away from them in the closing stages. Shane O’Donnell is the marquee attraction in this Clare U21 team, the only player who is a regular fixture on the senior side. Tonight he was well marshalled by the Waterford defence with Tadhg De Búrca screening effectively in front of him and O’Donnell finished the game scoreless. Instead the scoring slack was picked up elsewhere with Clare’s wing-forwards providing the inspiration. Bobby Duggan has been on the fringes of the senior team in 2015, tonight he reaffirmed his status as a quality free-taker in landing seven placed balls but also chipped in with six brilliant points from play. Ian Galvin stepped out of his brother Colm’s shadow with a quality showing as he also shot 0-6 from play. He only raised a single white flag in the opening half yet burst to life after the interval to be a thorn in the side of the Waterford defence. His contribution was a key reason for Clare’s ultimate victory. Recent exertions looked to have taken their toll in the ability of Waterford’s senior stars to dictate the terms of engagement here tonight. For a team that had plenty hope invested in them, stumbling at the penultimate provincial hurdle was deeply disappointing. The Waterford players reactions afterwards spoke volumes as to how much they were hurting. It’s been a chastening few days for Waterford’s emerging stars and lifting their spirits will be a key challenge now for senior boss Derek McGrath. Dublin loom in an All-Ireland quarter-final tussle on 26 July and Waterford need their young stars back on track. Manager Donal Moloney spoke afterwards how the U21 grade was so long a source of heartache for Clare but these days has become a source of joy. They landed maiden Munster and All-Ireland triumphs in 2009 before Moloney and his managerial sidekick Gerry O’Connor supervised a three-in-a-row on the provincial and national stages between 2012 and 2014. O’Connor departed last winter leaving Moloney as bainisteoir and he engineered a famous win tonight. This Clare U21 team is not populated with senior stars like the Banner sides of recent years yet that did not hinder them. A final beckons on 30 July and there’s huge potential in the likes of David Fitzgerald, Aidan McGuane, Conor Cleary, David Conroy, Kevin Hehir, Duggan, Galvin and O’Donnell. 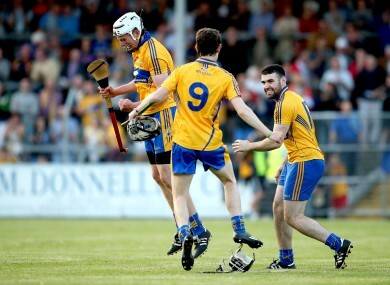 Email “5 talking points after Clare book Munster U21 final spot and Waterford bow out”. Feedback on “5 talking points after Clare book Munster U21 final spot and Waterford bow out”.